Real smiles… go for miles! During early 2012 we again saw a way to help our favourite community at Mphaphati, which was through facilitating a donation from a great crowd in the UK, who raise funds to put together basic stationary kits for under-privileged rural school children. 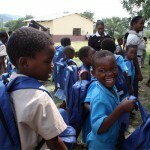 We helped to collect, transport and distribute 260 of these bags and it was a great day with plenty of smiles. Over the years Swazi Trails has a number of interactions with Young Heroes – an NGO that focuses on providing support to child-headed homesteads in Swaziland. In 2011, we decided to focus our existing support for the Mphaphati community, which has stretched back in to the early 1990’s, through Young Heroes. We had approached the community elders to ascertain what would be the greatest impact we could achieve with our annual donation to their community. Our contribution to Mphaphati stems from from the fact that our white-water rafting operation passes through this area and the people here have been warm and supportive hosts. It was highlighted by the community that there were a number of child-headed families within the community and knowing Young Heroes expertise in this field, we approached them to ask if their support network could be spread to cover Mphaphati. This they accepted on the back of our Swazi Trails commitment to donate E 15.00 per person for each participant on our white-water trips to Young Heroes. During 2008 we assisted Operation Smile with their mission in Swaziland. Founded in 1982, Operation Smile is a non-profit organisation of medical professionals who volunteer their time and skills to do reconstructive facial surgery on children all over the world. Swazi Trails partnered with them to provide transport over a period of 5 days to pick-up and drop-off patients and their parents at various locations across the country. It put a smile on our faces to be able to assist and we know for sure that it put a smile on a number of children’s faces, like never before. As organisers of the Swazi Xtreme 2006 (an annual adventure race that Swazi Trails organised from 2001 to 2010) we came into contact with Tiger Brands a large South African company that produces and markets Jungle Oats. They were looking for events in which their two celebratory athletes Bruce Fordyce and David Vlok could compete in, for a reality TV program – “Vlok & Fordyce on the Run”. The challenge was that if they succeeded in whatever challenge they undertook, then Jungle Oats would donate food for a year to a primary school. Well, we liked the idea and got fully involved. So much so that we convinced them that the beneficiary school really needed to be in Swaziland and not South Africa, and that just in case these two super heroes didn’t survive the whole Swazi Xtreme, which had a more than a 50% non-finisher rate, that they have their challenge split into 3 stages. Tiger Brands were a great sponsor and they agreed to put up Food for a Year for 3 primary schools, IF their team managed to tick off any of the designated checkpoints. The rest is history – Bruce and David, together with Lisa de Speville and Evan Price, finished the entire event. Bruce, a winner of a record number of Comrades Marathons, still rates this as the single hardest thing he has done in his life… and three Swazi Schools received food for a year. Swazi Trails played its part in assisting to deliver the food to each of these remote rural schools, which became quite a logistical mission in the end, dodging rain storms and negotiating washed-out roads. The three schools were Etjebovu Primary School in the Ngwempisi Valley, Engwenyameni Primary, up in the mountains above Malkerns and Mphaphati Primary down on the Great Usutu River. We chose these schools on the basis that each of these communities had shown us great hospitality with one or other of our events in the past and this was a way of returning the favour. So from September 2006 until August 2007 our Swazi Trails bakkie headed off loaded to the hilt to make these much appreciated food drops. Great opportunity – great impact. Back in “19-voetsek” when after the umteenth time our rafting transport vehicle was dug out of the mud with the help of community members from Mphaphati, we decided we really needed to find a way of returning these acts of assistance and generousity. Hence we initiated a small “levy” on all our rafting trips, such that each person contributed a small amount to a community fund. This levy is buried in our overall fee structure and many participants weren’t even aware that their fun in the sun was making a difference to lifes in the area. After much discussion with the traditional leadership of the area, through Indvuna Samson Dlamini, we agreed that the one institution in the area which all families interacted with in one way or another was the primary school. So we accummulated funds over time and were able to assist with firstly the purchase of school text books, thereafter the building of an office building for the school administration and final to the costs of an accommodation unit for teachers.